Gone are the days when people used to shop only by visiting brick and mortar stores. Shopping online, accessing cash back and huge discounts has made lives of everyone simpler and convenient. In this era of online shopping everyone is expecting all their favorite services and products to be just a click away. Entrepreneurs are striving to bring most of the products and services online. Be it seeking a mechanic or hiring a digital marketing agency, consulting a doctor or buying a car, everything is possible online now. Entrepreneurs with innovative ideas may be good or best when it comes to understanding their business. They make efficient business plans, but in this modern era of internet where online search influences most buying decisions of customers of every category, lose out on using true potential of online marketing. In this modern world digital advertising occupies a premium place in business development plans of successful organizations. Many organizations assume that having a website or an app will fetch them traffic, customers and online sales. Unfortunately this belief is so far from the fact. Increasing competition: Almost everyone is busy building startups alongside established businesses trying to put all their experience, wisdom and might on display in online space. When you type in one search word to look for a product or service, you get millions of results in a flicker of a second. With so many Internet based businesses around, it is like finding a needle in stack of haze. And by every passing day, more and more businesses ( read your competition ) are getting their websites and app out there. So you have to find a way to get the required eyeballs. Doing digital marketing: While some businesses are relaxed after making a website or an app and are waiting for customers to come to their website there are businesses that are embracing digital marketing. They are optimizing their site according to search engine algorithms ( read SEO – search engine optimization ) and are actively involved in social media marketing in order to get noticed and drive traffic. Those not moving with digital advertising are sure to be left behind. Engaging with customers: Through social media marketing and search engine rankings a business gets to know its customers. One can interact with the local customers and make sure that a positive image of their business is being developed. Like traditional businesses, online business also requires understanding customers and giving its customers a good experience to improve brand recall. Sales promotion techniques: online businesses can provide huge discounts. In order to win customers and retain them, one must adopt sales promotion techniques like giving discounts. Not only that, you must promote it as well. You will not get customers by introducing a sale on your app or website and waiting for customers to visit your site. You will have to wake up and take steps in order to make your offers reach till people. You can drive home the message to millions of people in one go through social media marketing or email marketing. Creating brand awareness: Your business may have several USP’s but how do people and your customers know about it, you have to reach out to them. You cannot sit back and expect customers to stumble upon your website or app and discover the USP’s. Any brand needs re hammering in the memories of customers. It is like out of site out of mind. Coca cola, in spite of being the largest selling cola brand in the world, spends so much on advertising. Your business needs support from digital media agency to do all this. The rise of e-commerce and Internet based companies has made it difficult for retail sector to thrive. While retail sector is on back foot there are some Internet based enterprises that are failing too because they are avoiding digital marketing. Enterprises need to indulge in digital marketing in order to win the online audience. 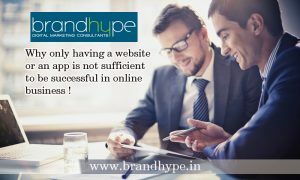 Brandhype is helping Internet based startups and established businesses to acquire the best of online reputation and discover a unique user base for their companies.